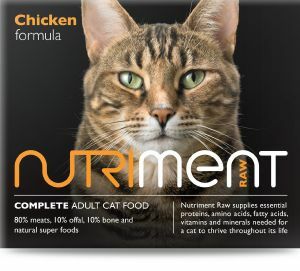 Good item- correct levels of meat / organs etc- the only thing is I would prefer if it Nutriment could take out the beef as it is not natural for cats to eat, and my cat is more sensitive than most, but still far better than most other frozen raw food brands for cats! Cats love this food. Quality has been a bit hit-and-miss lately, so have had to bin and feed them dry food when it happens. Don't like upsetting their digestion, but they think kibble is a 'treat', so they're fine with it. It's the closest I can find to what we fed our cats in Canada. Would be grand if they'd do turkey for cats as well, since they do it for dogs already. They do eat it 90% of the time, though we have to give them turkey mince every now and again; they go through fussy phases and just won't eat it. Spoiled cats. Still a tentative review, she doesn't eat it all but some now and again. This is the best quality cat food we've found since moving to the UK. Our cats love raw food; wish they had turkey for cats, as they do for dogs, though. It's their favourite. This is the closest I could find to the very high-quality raw food in Vancouver. The packs are a little big for cats, but we keep the fridge really cold to make it last without turning. Well done; this was the fourth company we'd tried. Were really afraid we'd never find a raw food they'd actually eat here. Plus, the people at Nutriment are very nice. :-) Recommend.